Most people think they want to lose weight, but they really want to lose fat and build muscle. But there is more to all this to just than just looking good naked and getting abs. Keeping your body fat low and muscle mass high is central to managing diabetes and the plethora of metabolic diseases that are plaguing us today. While the first Nutrient Optimiser Challenge was set up to look like a weight loss competition, the meal plans and optimised foods and meals were created to enable users to maximise fat loss while minimising loss of lean body mass (LBM) through the use of high satiety, nutrient-dense meals that contain adequate protein. 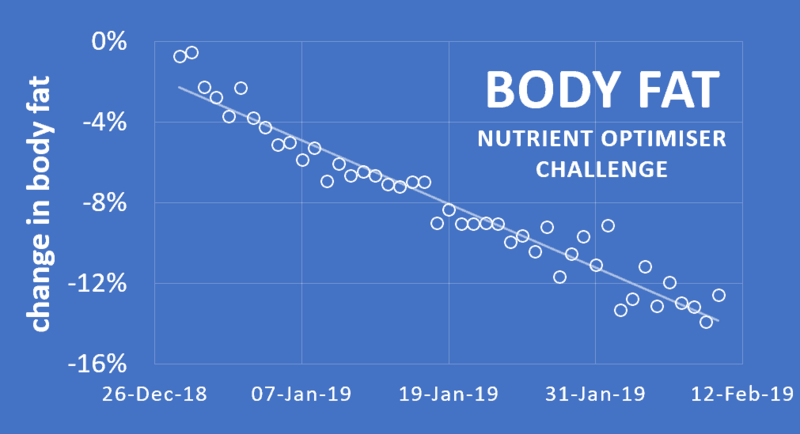 This gives an overview of the rate of body fat loss, lean mass and reduction in waist circumference achieved by the participants who used the Nutrient Optimiser in the challenge in order to set a reasonable benchmark and expectations for future users. Your waist to height ratio is an excellent marker of metabolic health, with a waist to height ratio of 0.5 aligning with the best odd for longevity. The chart below shows the reduction in waist during the challenge, with an average loss of around 6.5% over the six weeks. On average, people reduced their body fat at a rate of 1.8% per week during the challenge (i.e. change in body fat / starting body fat). The average change in body fat for men was 2.1% per week and 1.6% per week for women. Tracking weight alone can be unnecessarily discouraging. It can be much more useful to track lean mass and body fat separately rather than just weight alone. The holy grail that many people strive for is ‘re-composition’ where we see body fat go down and lean mass increase. The chart below shows that most people gained a significant of lean mass during the challenge. As shown in the charts below, the growth in lean mass was greater in women than men. This could be because many of the women were starting from a relatively low protein intake with lower levels of lean body mass. Hence, they responded with a relatively quick growth in lean body mass, even without necessarily adding resistance exercise. We saw a a fairly wide range of variance in these rates of change. Some lost lost lean mass while some gained gained significant amounts of lean mass. how much lean mass you start out with. To understand what this looks like in practice we have presented a number of body fat vs LBM charts for different individuals. While there is some noise/scatter in the short term, we can still monitor and manage the long term trend. The Nutrient Optimiser Smart Macros algorithm recommends an increase in protein intake where a user is losing more lean body mass than fat mass. The chart below shows the fat mass vs lean body mass for Sergey who started the competition at a fairly high 300 lbs (137 kg) and 40% body fat. We can see his fat mass (blue) trending down while his lean body mass stays (orange) fairly stable across the duration of the challenge. The chart below shows the rate of fat loss and lean body mass for Jason who started the challenge at 238 lbs (108kg) and leaner 24% body fat. While some lean mass was lost during the challenge, Jason was still able to lose more body fat than lean mass. The chart below shows the rate of body fat and lean mass change of Diane who started the challenge at 157 lbs (71 kg) and 34% body fat. We can see that her rate of change in lean body mass is still less than fat mass, but getting closer than Sergey or Jason above who are further from their ideal body weight. It’s worth noting here that different body fat scales can give more consistent results. Diane uses the Soehnle Shape Sense Control 200 digital scale which appears to provide really reliable data. People with more fat to lose are more likely to find it easier to maintain their lean mass and lose fat (i.e. recomposition). Focusing on high satiety meals will provide plenty of protein to enable them to retain muscle during fat loss. In contrast, leaner people will need to be more careful to eat enough protein and not lose weight too quickly in order to ensure that they don’t lose excessive levels of lean mass. As shown in the chart below from a recent review paper by Stuart Phillips, muscle mass is best preserved when we have higher levels of protein, particularly if you are targeting an aggressive deficit and working out. If you are targeting a moderate energy deficit (e.g. 10%) then a minimum protein intake of around 1.5g/kg BW may be adequate. However, if your are targeting a very aggressive energy deficit then higher levels (up to 2.6g/kg BW) will be beneficial to prevent loss of lean mass. If you are active and undertaking resistance training you will also need more protein to maintain lean mass (dashed line to the right) while we need less if we are sedentary (dotted line to the left). Eric Helm’s Master’s Thesis also made a similar conclusion, finding that bodybuilders undergoing significant calorie restriction need to consume up to 3.1 g/kg LBM to maximise preservation of lean muscle. Practically it can be quite hard to find foods that will provide enough protein in a large calorie deficit. For people who are looking for a more casual and long term sustainable weight loss, the Nutrient Optimiser will highlight foods and meals that will tend to provide adequate protein, nutrients with high levels of satiety. However, if you are preparing for a bodybuilding competition or are serious about driving a rapid change in your body composition, the Smart Macros can help you dial in your protein, fat and carb ranges to achieve your goals. If you’re interested in seeing what foods and meals Nutrient Optimiser would recommend for you we’d love you to check out the Nutrient Optimiser Free report. You can also join the Nutrient Optimiser Facebook Group to ask questions and see some amazing meals. Registrations are now open for the Free Four Week Nutrient Density Challenge. We’d love you to sign up and see what happens when you level up your nutrient density.